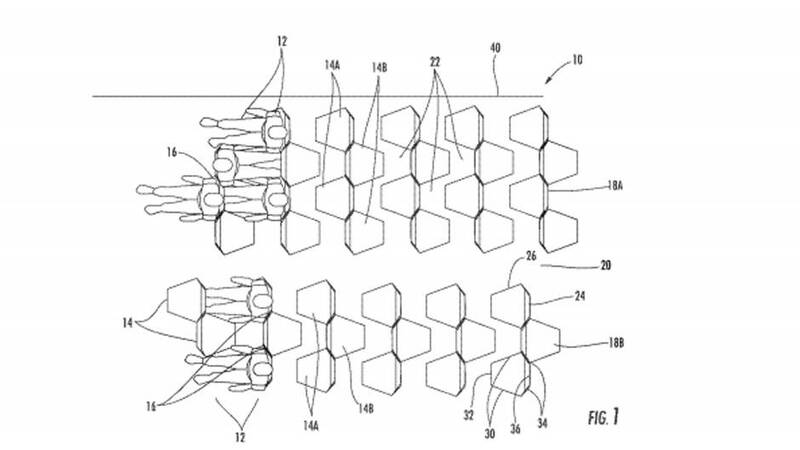 Zodiac Seats France, one of the biggest manufacturers of aircraft passenger seats, has filed a patent for a seating configuration that would have passengers facing each other. If you think flying economy class is already as bad as it could be, brace yourself for some horrifying news. Economy passengers are already crammed in tight, with little to no leg room, they’re fighting for elbow space and are forced to eat terrible food, often at an extra cost. Now comes the ultimate horror. In other words, it’s a way of cramming even more people onto a plane. Yes, this “most atrocious idea for airplane seating design” does “almost seem like a sick joke,” as Gizmodo’s Adam Clark Estes puts it. The good news is that the company has no plans at the moment to put the new design in to production. But given the devolution of the economy class experience – shrinking seats, shrinking service, shrinking expectations – it is probably only a matter of time before we are all stuffed into the hexagon. Please let it not be so. The last remaining decent thing about flying economy class is being able to put your nose in a book or stare at a movie while pretending the people around you don’t exist. What will happen when you’re stuck in the hexagon design across from that guy who wants to chit chat during the entire flight? How much polite conversation will you be forced to make just because you’re staring straight at someone, and even though you don’t want to talk, and they probably don’t either, you kind of feel you have to? And when are they going to bring you a drink? Do they even do that any more? Please, make it stop.